April to October is the main tourist season, which roughly coincides with the drier months and your best shot at successive sunny days. August is festival time in Edinburgh—from Fringe to military—making room reservations an absolute necessity. The main golf season runs from April to September and most fishing seasons begin in February and end in October. Most flights from Canada require a connection in London, though some charters offer direct flights from Toronto to Glasgow. There are direct flights to major Scottish destinations from cities throughout the United Kingdom and Europe. Frequent train service connects London to both Edinburgh and Glasgow, but choosing from among the 20 bus companies running the same routes will save you money at the expense of time and comfort. Getting a Domestic flights are expensive and probably unnecessary given rail and bus options and the relatively short distances. British Airways flies regularly to the Orkney and Shetland islands, though, two of the destinations more worthy of a plane. Buses are cheaper than trains and serve most of the country, but can’t compete with the luxury of The Royal Scotsman, one of the world’s most lavish train rides. Glasgow and Edinburgh have good public transit and plenty of taxis, and Edinburgh also has well-marked bicycle lanes. Visits to Scotland typically begin in one, or both, of its major cities. The capital’s signature landmark, Edinburgh Castle, governs the city’s skyline from its post atop an extinct volcano. Its oldest sections date back to the 1100s, with significant additions in the 16th, 17th and 19th centuries. Perhaps more celebrated than its castle is Edinburgh’s glut of summer festivals. Attracting more than a million visitors in August and September, they feature music, theatre and the world’s largest book festival. Once “The Second City of the Empire” during its 19th-century heyday as Britain’s shipbuilding hub, Glasgow suffered an industrial decline before regenerating as a cultural centre in the 1980s. Just 72 kilometres west of Edinburgh, Glasgow is the edgy sibling, compensating for its lack of monumental beauty with a dynamic local arts scene. 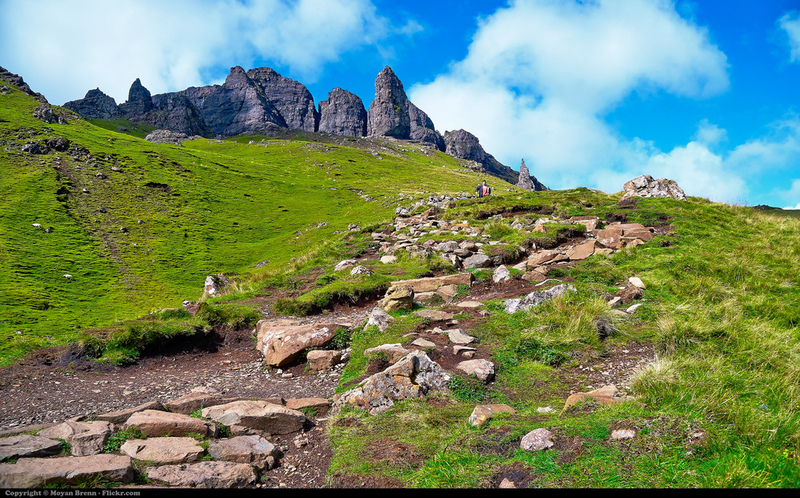 Hikers have a wealth of options in Scotland’s damp and rugged terrain. The West Highland Way is a 152-kilometre walk from Glasgow’s outskirts to the Scottish Highlands. An alternative hike with a twist—or a stumble—is the Malt Whisky Trail in Speyside, a tongue-testing trek to seven working whisky distilleries, including Glen Moray, Glenfiddich and Chivas Regal. Perthshire—proud home to both the world’s highest hedge and Europe’s oldest tree—is also Scotland’s superlative adventure sport area, offering fishing, mountain biking, kayaking and canyoning among other active pursuits.